Technology may help breathe new life into toll roads. 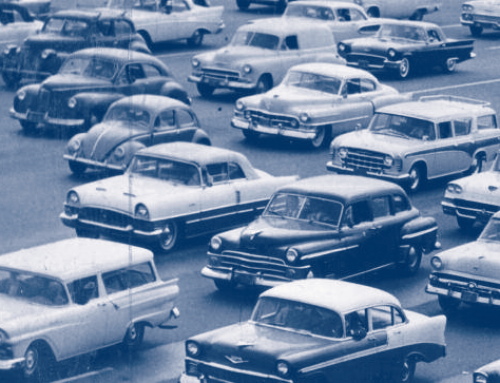 The notion of private highways, which must have seemed fantastic to Americans just a few years ago, was commonplace to our great-great-grandparents. Built in the 1 790s in the growing Republic, the first toll roads stimulated commerce, settlement, and population. Fiscal constraints and insufficient administrative manpower led communities to search outside the public sector for help. 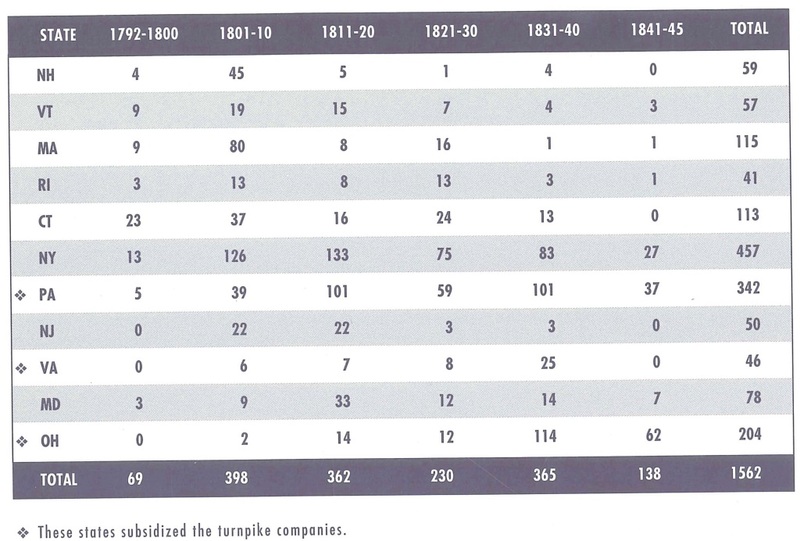 During the 19th century more than 2,000 private companies financed, built, and operated toll roads. A glimpse at our history may provide a useful perspective on today’s budding toll-road movement. Private road companies in the 19th century answered an urgent community need, where the government couldn’t, and they did it with creativity and motivation. The investment impetus and indirect benefits animated merchants, farmers, and landowners to support toll roads. At times when government regulations limited the roads’ profitability, local boosterism and the participatory ethic encouraged community members to keep investing. The acuity of private initiative established toll roads from the Atlantic to the Pacific Ocean. Once the Commonwealth of Pennsylvania chartered a private company in 1792 to build a road connecting Philadelphia and Lancaster, rival states were stimulated to try similar projects. Private initiative was then the only effective means of providing new highways because state and county resources were scarce, and town resources were meager. In an age before the canal and railroad, legislators were willing to try anything to get some means of transport constructed. However, the turnpike movement had its problems. About a third of the chartered companies failed to construct any roads, and many turnpikes that were completed paid very small dividends or none at all. Toll evasion was rampant, as people learned to go around the tollgates, a practice known as “shunpiking.” In many cases, roads were built in advance of settlement, where travel demand was low. Furthermore, legal restrictions hampered the turnpikes’ abilities to turn a profit. Toll rates were set by law; generous toll exemptions were granted to local travelers; tollgates were separated by great distances; and countermeasures to shunpiking were denied legislative approval. But unprofitability did not necessarily mean unfruitfulness. 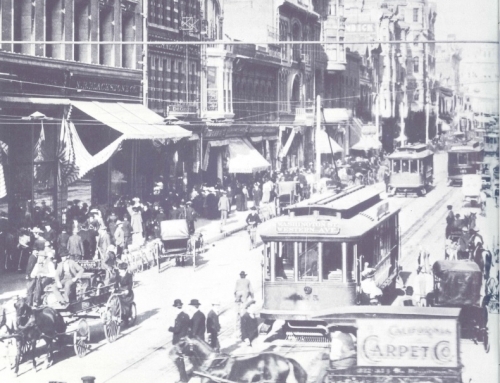 Even an unprofitable turnpike improved transportation for the community, stimulating commerce, raising land values, and aiding in the race for expansion. So community leaders sought ways to secure subscription to turnpike stock despite the sad prospects for dividends. They resorted to a fascinating array of tactics to boost the turnpike cause. 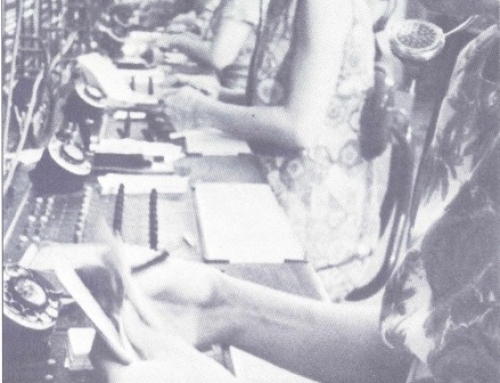 They applied social pressure through newspaper appeals, town meetings, door-to-door solicitations, and correspondence. In the early Republic, American communities had to rely on volunteers for a great many services; and, as Alexis de Tocqueville so elegantly described it, they were effective in using local participation, rather than government power, to provide many essential services. 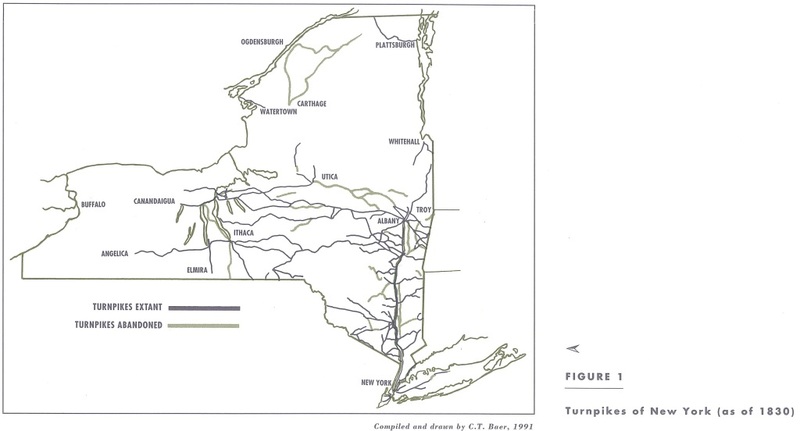 The resulting turnpike construction in New York is shown in Figure 1. In the late 1820s, canals began taking business away from the major turnpikes. Railroads joined in a bit later. Between 1825 and 1845 existing turnpike mileage dropped considerably. However, the canals and railroads changed the patterns of trade and development, and they stimulated new demands for shorter toll roads that would serve as feeders. Table 1 shows that turnpike activity by no means ceased with the advent of canals and rails. High hopes for a new kind of short feeder road attached to the idea of plank roads. Organized like turnpikes, the new roads were surfaced with wooden planks, which promised a smooth, inexpensive alternative to the rivers of mud that turnpikes sometimes resembled. In the late 1840s and early 1850s, more than one thousand plank roads were constructed nationwide. (See Table 2.) For this new burst of toll-road chartering, a high percentage were successfully constructed (perhaps 80 percent) and always strictly with private funds. 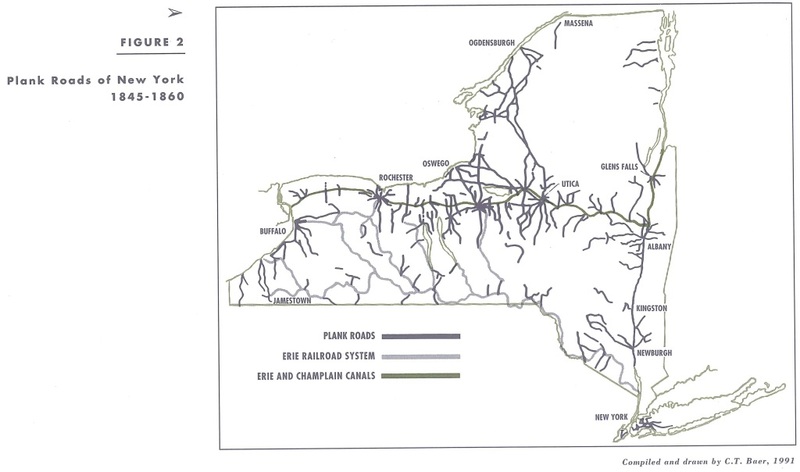 Figure 2 shows the plank road system in New York in mid-century. Compared to the turnpike system of the previous generation, the plank road system shows a nodal structure. Civil engineers and enthusiasts predicted that plank roads would last eight years before needing to be resurfaced. But, to the chagrin of everyone, the planks wore out twice as fast as the experts had predicted-usually within four years. The movement ended as suddenly as it began. Most plank road companies folded, while many converted their operations to turnpikes surfaced with gravel. 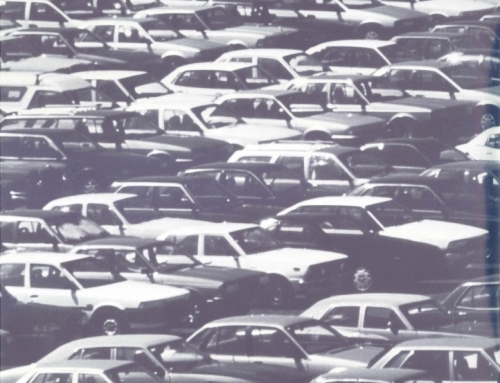 The toll-road idea endured to the end of the century, and it traversed the country. When miners struck gold, silver, copper, and other minerals in the West, hordes of newcomers rushed there, and with them came the means for their survival. Entrepreneurs organized toll-road enterprises to serve the mining communities, and some got rich in the process. More than 150 toll roads were constructed in California, more than 200 in areas that would later become Colorado and Nevada. This experience in the Far West casts doubt on the notion that government must provide infrastructure as a precondition to economic development. Given favorable circumstances, it seems that private developers can generate infrastructure on their own, especially when they can prevent toll evasion, as they can today. the ownership and operation of this road by a private corporation is contrary to public sentiment in this county, and [the] cause of good roads, which has received so much attention in this state in recent years, requires that this antiquated system should be abolished …. That public opinion throughout the state is strongly in favor of the abolition of toll roads is indicated by the fact that since the passage of the act of 1899, which permits counties to acquire these roads, the boards of supervisors of most of the counties where such roads have existed have availed themselves of its provisions and have practically abolished the toll road. At this time the federal government itself became interested in highway development, while showing low regard for the private toll road. Although private toll roads proliferated in the 19th century, the Federal Aid Highway Act of 1916 barred the use of tolls on any highways receiving federal money. Thus, anti-toll-road sentiment became national policy. Privatization has come into increased favor, and many states have embarked on franchising new highway facilities to private consortia. In 1992 Congress passed the Intermodal Surface Transportation Efficiency Act (ISTEA), which, according to Robert Poole of the Reason Foundation “contains the most sweeping privatization provisions ever enacted by Congress.” ISTEA reverses the 76-year policy against toll roads. Under this act, federal funds can now go toward toll roads, including private toll roads, and states no longer have to repay federal funds if a facility is privatized. America can again test the effectiveness of private management of highways and the economic value of user charges. With new electronic technologies of toll collection, toll roads may be more feasible than before. And, with knowledge of our past, perhaps we can be encouraged to plan them more effectively and thus to avoid old pitfalls. Atlantic States and Maryland, Vandosta, Georgia: 1931. Gerald Gunderson, “Privatization and the 19th-Century Turnpike,” Cato Journal, Vol. 9, Spring/Summer 1989. Gordon J. 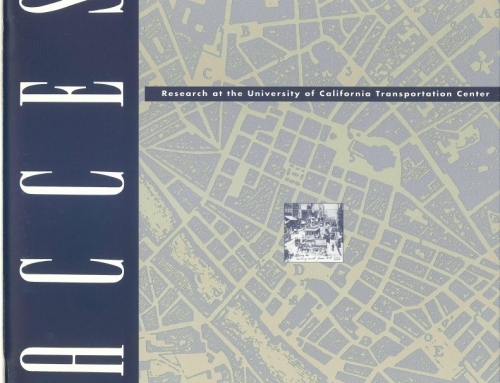 Fielding and Daniel B. Klein, “How to Franchise Highways,” 1992, UCTC No. 134. Daniel B . Klein, .. The Voluntary Provision of Public Goods? The Turnpike Companies of Early America.” Economic Inquiry, Vol. 28, Oct. 1990. UCTC No. 18. Daniel B. Klein and Gordon J. Fielding, “Private Toll Roads: Learning from the 19th Century,” Transportation Quarterly, Vol. 46, July 1992. UCTC No. 118. Daniel B. Klein and John Majewski, “Economy, Community and Law: The Turnpike Movement in New York, 1797-184S,” Law and Society Review, Vol. 26, 1992, pp. 469-S12. UCTC No. 76. Daniel B. Klein and John Majewski, “Promoters and Investors in America: The Spread of Plank Road Fever,” UC-Irvine ITS WP 91-1. 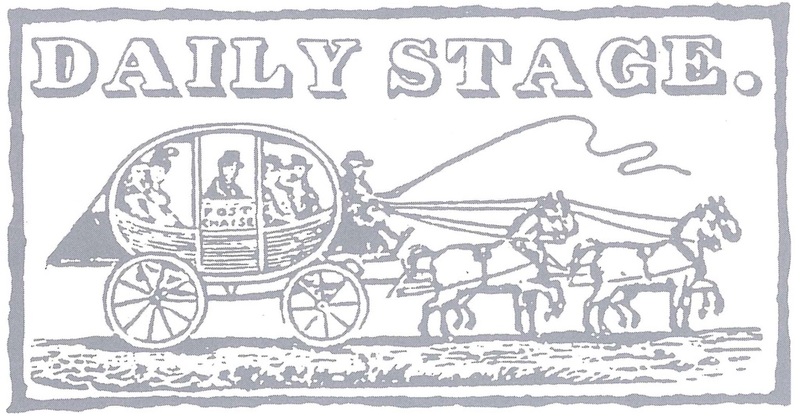 John Majewski, Christopher T. Baer, and Daniel B . Klein, “Responding to Relative Decline: The Plank Road Boom of Antebellum New York,” Journal of Economic History, Vol. S3, March 1993, pp.106-122. 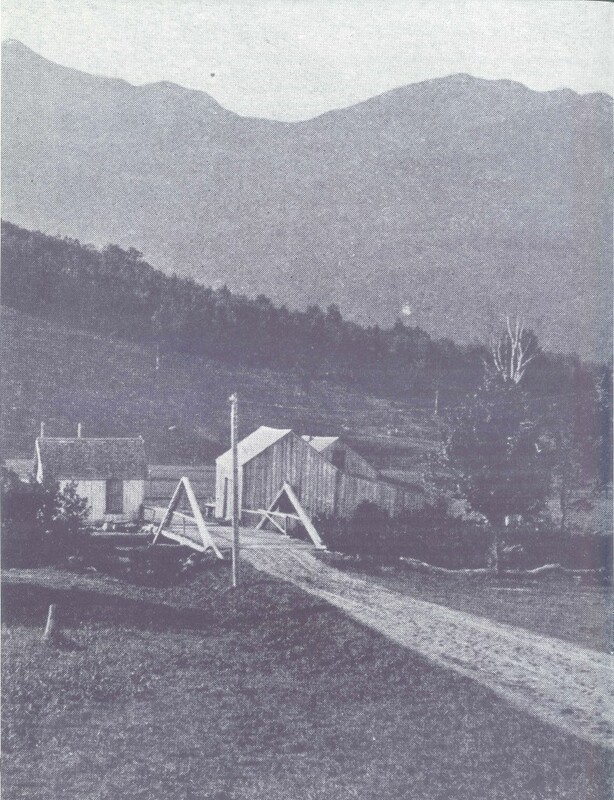 Philip E. Taylor, “The Turnpike Era in New England,” Ph.D. dissertation, Yale University, 1934.